It’s the 23rd of September and this low pressure system to our east continues to produce precipitation here at base camp and now above base camp. When you sleep through the night in a steady snowstorm as we all did last night it soon gets very quiet. Our VE-25’s had a thick layer of snow them that insulated us from the sound and I think most of us slept unaware that it might be snowing. Jimmy commented this morning that is was quite warm and that is one thing that clues you in when it gets quiet and warm there is probably some snow building up on your tent. The other thing that clued us in was at about 4:30 this morning a crew of Sherpas were out shaking the snow off our tent and reminding us that is was almost morning and there was some snow to clear. 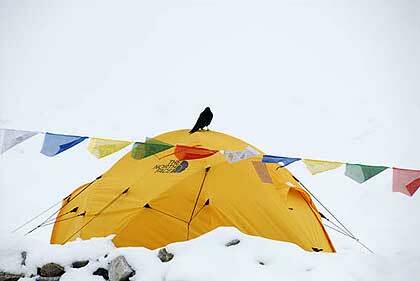 So I got up wondering what was going on up at Camp 2, what Ang Pemba and Dawa Tsering were reporting. 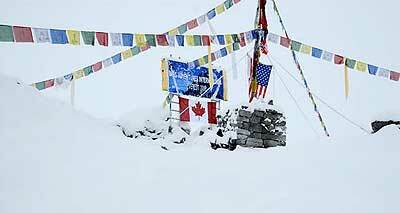 It took us awhile to get them on the radio but finally they reported that they did have about the same amount of snow at Camp 2 and later in the day they reported that the snow has intensified up there and they can see slides coming down off the Lhotse face. Fortunately not right at our fixed lines but out in the middle of the face. Of course the slides are good, we need the snow to come off the Lhotse face but we were hoping there would not be quite so much precipitation that high on Everest. Regardless we are snug where we need to be here at base camp and the guys are keeping Camp 2 in good order, knocking the snow off the tents and we are just going to ride this snowstorm out and see what tomorrow brings and see how soon we can take a look back up the route past Camp 1 and into the Western Cwm. Meanwhile we are buttoned down here at base camp and doing well.